Dubai Municipality and Veolia have signed a contract to enhance the capabilities of a hazardous liquid waste treatment plant. The agreement is a first of its kind in the UAE, and aims to make Dubai ready for the anticipated increase in the quantity of hazardous liquid waste, as existing industries expand and new ones are set up. The plant is expected to be commissioned by the end of 2017 and will be able to treat 200 cubic metres of hazardous liquid waste, including acidic waste, alkaline waste, oily waste and wastewater. Keep up with the latest updates to this project by clicking here. On 22nd November 2016, Ebioss Energy announced that it is to jointly develop two new waste gasification plants at Hull and Newcastle, in collaboration with Energy China (China Energy Engineering Corporation) and another unnamed party. The Hull facility will have a generating capacity of 20 MW and a throughput of up to 120,000 tonnes per annum (tpa) of refuse-derived fuel produced from municipal solid fuel. The Newcastle facility will have a generating capacity of up to 12 MW and a throughput of up to 72,000 tpa. The projects are expected to cost £93 million and £53 million, respectively. Don’t miss out on updates for both the Hull and Newcastle facilities. In the week ended 25th November 2016, AcuComm added 43 new or updated projects to our Business db, worth an estimated US$3,259 million and waste capacity of just over 7 million tonnes. The total investment value of projects is now US$346.1 billion. WtE incineration was the largest category in terms of waste capacity, accounting for just over 3.5 millions tonnes. The leading country in the past week was the UK with 15 projects. This was followed by the USA with ten and Canada with three. 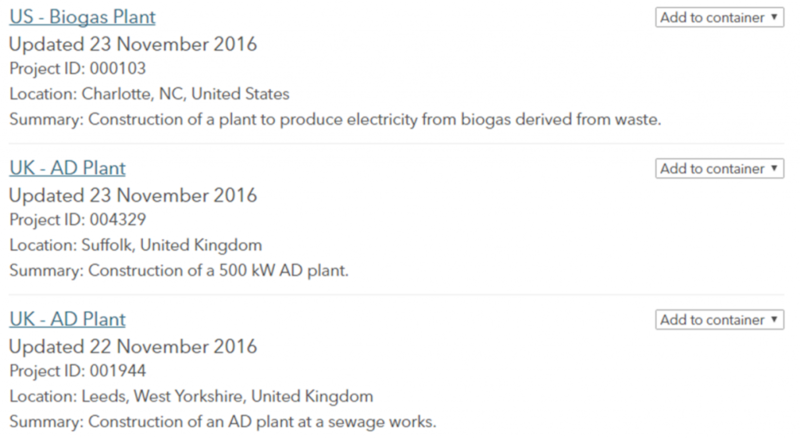 With AcuComm’s search function, you can generate your own tailored list of opportunities for the Waste, Bioenergy and Recycling sectors. Your search criteria is translated into a robust set of metrics, partnered with complete project details and contact information for the key individuals involved. To discover the benefits for yourself, book a demo today. Hitachi Zosen has signed a ¥24.7 billion design-build-operate contract with the Asakawa Seiyu Environment Association for the construction of a waste-to-energy (WtE) facility in Hino City, Tokyo, with a waste throughput of 228 tonnes per day. The facility will be operated by Asakawa Environment Technology, a special purpose company set up by the two joint venture partners in conjunction with Hitz Environmental Services. To find out more on this development, click here. NGF Nature Energy has announced that groundwork has started on the construction of a new biogas plant in Korskro. NGF Nature Energy is undertaking the project in association with Sydvestjysk Biogas, a collective of 100 livestock farmers who will supply feedstock, primarily in the form of manure and deep litter, to the plant. When completed, the plant will be Denmark’s largest biogas facility, processing 710,000 tonnes of waste per annum. Biogas production is expected to total 22 million cubic metres per annum, which will be fed into the Danish natural gas network. Keep up-to-date with this project by clicking here. At AcuComm, our determination to provide subscribers with access to unrivalled amounts of actionable information is at the heart of everything we do. The new changes to our Search function are just the latest in a continuous development process, making it quicker and easier for you to identify the projects and contacts that matter to your organisation. Our search categories have been simplified and refined to better reflect the pace of movement in the Waste, Bioenergy and Recycling Sectors. Please rest assured the improvements made to the search categories should not affect any existing saved searches. Furthermore, to help identify each project, we now include a unique ID in with the search results. Finding the right projects that are right for your organisation will be quicker and easier, with the new categorisation better reflecting the current Waste, Bioenergy and Recycling sector. The newly introduced unique project IDs will help you identify particular projects amongst your saved searches far more easily, saving you valuable time. Your search results will now directly align with the strategic insights delivered in AcuComm’s monthly db Monitor. This means you can get an even deeper understanding of the different markets that make up the Waste, Bioenergy and Recycling sectors. If you’ve not seen db Monitor before, it is the only source of real-time market analysis and strategic sales information for businesses selling into the Waste, Bioenergy and Recycling sectors. It has rapidly become an essential sales tool for our clients. To see for yourself, request your complimentary hard copy of the latest issue by emailing [email protected]. To discover how your organisation can increase sales by using db Monitor alongside the Business db database, arrange a demo with a member of our team today. With just 15 minutes of your time, we can walk you through how other businesses are using the monthly publication successfully to grow and develop sales and new markets. To arrange a convenient time for your demo, give us a call on 01243 788686 or email [email protected]. In the week ended 18th November 2016, AcuComm added 50 new or updated projects to our Business db, worth an estimated US$4,705 million and waste capacity of just under 8.2 million tonnes. 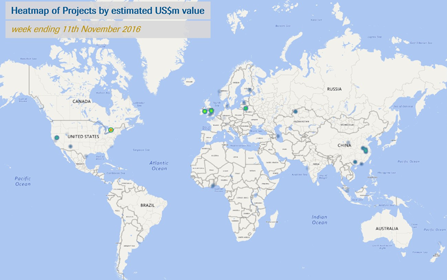 The total estimated investment value of projects in our database is now US$344.2 billion. MSW was the leading feedstock reported on, accounting for an estimated 3.6 million tonnes, or 44.6% of the total. This was followed by wood with just under 2.3 million tonnes. The leading country from the past week was the USA with 15 projects. This was followed by the UK with ten and Canada with five. At AcuComm, our unique understanding of the Waste, Bioenergy and Recycling sectors means that we can provide leading organisations with the strategic insights required to make business-critical decisions. Our Weekly Project Updates provide just a glimpse into this information, which our researchers are collecting on daily basis. Get in touch with one of the team today to find out how we can help. At the end of October 2016, the Brihanmumbai Municipal Corporation issued a tender for a design, build and operate contract for a waste-to-energy facility at the Deonar dumping ground. The tender states that the facility will receive 3,000 tonnes of waste per day and generate a minimum of 25 MW. The contract period will be 20 years, including three years for construction. Tenders close on 5th January 2017. To find out more on this project, click here. On 26th October 2016, a new municipal solid waste treatment facility and composting plant was inaugurated at the environmental complex in Valsequillo, located in the municipality of Antequera. The works involved an investment of €20.9 million, 80% financed with funds from the EU. The facility will serve more than 430,000 people when it is operational and will be one of the most advanced in Andalucia. It is due to start operating in the first half of 2017. To take a look at more information on this project, click here. In the week ended 11th November 2016, AcuComm added 45 new or updated projects to our Business db, worth an estimated US$5,167 million and waste capacity of just over 9.9 million tonnes. 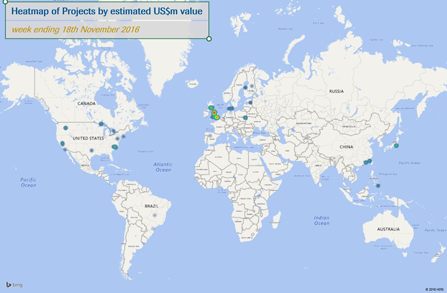 The total estimated investment value of projects in our database has now reached US$343.9 billion. MSW was the leading feedstock type reported on in the past week, accounting for 5.3 million tonnes, or 53.9% of the total. This was followed by industrial waste with 1.6 million tonnes. The leading country in the past week was the USA with 12 projects. This was followed by China with six and the UK and Hong Kong with three apiece. A number of industry-leading companies are using AcuComm’s Sales Package as an integral component of their sales function. As a subscriber, you too can be the first to act on the latest opportunities in the Waste, Bioenergy and Recycling sectors, with key decision-makers provided for each project. To experience the benefits for yourself, book a demo with one of the team today. The Provincial Council of Gipuzkoa is planning to construct a new €212 million Waste Management Centre (WMC) in Zubieta. On 28th October 2016, it was announced that three bids have been submitted following a public tender for the contract for the design, financing, construction, operation and maintenance of Gipuzkoa Environmental Complex Phase 1. For more details on this project, click here. The Council of Ministers has decided that eight new waste-to-energy (WtE) plants are to be constructed that will provide a total capacity of 1.8 million tonnes per annum (tpa) for municipal solid waste (MSW) or similar. Three plants are to be located in central Italy: Umbria, Marche and Lazio; two in the south: Abruzzo and Campania; one in Sardinia, and two in Sicily. Puglia is willing to strengthen its existing capacity by 70,000 tonnes. Keep up-to-date with these developments by clicking here. In the week ended 4th November 2016, AcuComm added 43 new or updated waste projects to our Business db, worth an estimated US$3,382 million and waste capacity of just under 9 million tonnes. Total power generation was estimated to be around 675 MW; WtE incineration was the largest category, accounting for 520 MW. The leading country in the past week was the USA with 13 projects. This was followed by the UK with six and Russia with five. If you are looking to identify the latest opportunities available to your organisation, then look no further than AcuComm’s Search Analytics. Whether it’s a recycling plant in Spain or an anaerobic digestion facility in the UK, Search Analytics is the perfect tool to help you to asses sales pipeline potential. Plus, it’s free to use! To find out how this or any of AcuComm’s other products can benefit your organisation, book a demo with the team today. Kathmandu Metropolitan City (KMC) is undertaking the Promoting Integrated Sustainable Solid Waste Management Project, which includes the development of a pilot biogas plant project. In October 2016, the Himalayan Times reported that the plant has started generating both biogas and electricity from waste. This is the first time that electricity has been generated from waste in Nepal. For more information on this plant, click here. Argent Energy has developed a £75 million facility to convert waste oils and fats into methyl ester for biodiesel fuel production at Ellesmere Port, near Chester. Commissioning took place in mid-2016 and on 18th October 2016, the Environment Agency issued a permit for the facility to operate. The site, which is the first of its kind in Europe, receives and processes 90,000 tonnes per year (tpy) of non-hazardous waste fats, oils and greases, and 26,000 tpy of non-hazardous tallow. The waste will generate up to 75,000 tpy of methyl ester, which will be sent off-site for further recovery as biodiesel. To find out more about this unique facility, click here.